If you are anything like me your workouts have intensified a bit as swimsuit season approaches! Cherry juice helps prevent and alleviate muscle soreness, making it a great recovery drink after any rigorous activity. Cherry juice can be enjoyed alone, but isn't everything a little better when chocolate is involved? Recipe provided by the Cherry Marketing Institute. Melt chocolate in saucepan over low heat or in the microwave for a few seconds. 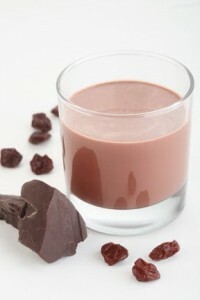 Add chocolate milk, tart cherry juice concentrate, yogurt, and melted chocolate together and blend or mix well. Chill and serve.